The Arecibo Observatory sustained serious damage during Hurricane Maria. The pointy object protruding downward from the suspended platform is a 96-foot (29 meters) antenna that broke off during the hurricane, puncturing the telescope dish below. Scientists' reactions range from joy to cautious optimism at the news that the iconic Arecibo Observatory — often used to pose the question, "Are we alone?" — will continue operations after enduring a powerful hurricane and dramatic budget constraints. The Arecibo Observatory in Puerto Rico celebrated its 50th anniversary in 2013. During its long history, Arecibo has served as the home base to large-scale astronomical research projects and has joined the search for extraterrestrial intelligence with programs like the "Arecibo Message" of 1974, which was the first interstellar message sent from Earth that was intended for alien life-forms who may have been capable of listening. In 1993, Joseph Hooton Taylor Jr. and Russell Hulse won the Nobel Prize in physics for using Arecibo to make the first-ever observation of a binary pulsar star system. The study of the circling stellar cores from Arecibo provided early, indirect evidence of gravitational waves, which are currently in the scientific spotlight. This image reveals previously hidden features around an area near the Apollo 17 landing site on the moon. Signals beamed from the Arecibo Observatory in Puerto Rico penetrated deep into the moon, then bounced back and were detected by the Green Bank Telescope in West Virginia. Researchers use this technique, called bistatic radar, to study many solar system objects, from asteroids to other planets. In this case, it revealed subsurface details in two lunar locales, the Mare Serenitatis, or Sea of Serenity, and a crater called Aristillus. Until recently, the observatory also functioned as the largest radio dish telescope in the world, with a diameter of 1,000 feet (305 meters). Arecibo's legacy of prominence also includes the first use of radar ranging to determine an asteroid's distance from Earth when crossing the planet's orbit, early mapping of several objects in the solar system and the first detections of planets in orbit around other stars, according to Stanford Research Institute International, which manages the observatory alongside the National Science Foundation (NSF), the Universities Space Research Association and the Universidad Metropolitana in San Juan. But in the last few years, Arecibo has been at risk of losing funding from NSF, which, according to the foundation, stems from budget constraints. Then on Sept. 20, Hurricane Maria hit the island of Puerto Rico as a Category 4 storm, causing the entire facility to lose power and adding to concerns that operations might permanently shut down, due to the cost of recovery. "Arecibo Observatory is uniquely capable of performing many atmospheric studies that cannot be conducted at any other facility worldwide," Frank T. Djuth, president of Geospace Research. in El Segundo, California, told Space.com in an email. "These include the continuous passage of acoustic gravity waves over the Observatory and instabilities in the photoelectrons produced in the upper atmosphere. 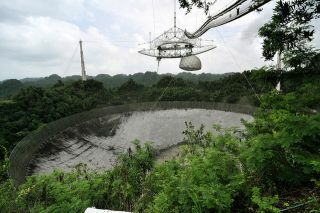 Although Arecibo will remain open, there is concern that federal funding of Arecibo research will disappear." Ellen Howell from the Lunar and Planetary Laboratory at the University of Arizona, has, like Djuth, performed research at Arecibo. Howell was pleased about NSF's decision to continue managing the facility for the next five years. In an email to Space.com, Howell said she was a staff scientist at the observatory from 1999 to 2015 — almost 16 years — and continues to use the telescope for her research while collaborating with scientists currently working there. While she was relieved, Howell remains concerned about Arecibo's future: According to NSF's earlier budget statement, the foundation will significantly reduce funding — from $8.3 million to just $2 million a year — by the end of the proposed five-year project period. Radar image of asteroid 1998 QE2 and its moon taken on June 7, 2013, by the Arecibo Observatory. Several craters are visible on the asteroid, and the moon appears as a bright streak. Each pixel is 7.5 meters (25 feet) across. "In consideration of these reductions, operations and activities cannot be sustained at current levels without external sources of funding," NSF officials said in the statement. Howell believes that "the operation mode would have to change in a major way," since the funding provides "critical support" for Arecibo's infrastructure and operation. Nevertheless, the scientific community remains hopeful that Arecibo can continue facilitating innovations in science. "With continued operations," Hessels said, "and hopefully also an increased budget to equip the telescope with new, state-of-the-art electronics in the coming years, Arecibo is bound to continue its heritage of fundamental discoveries." Follow Doris Elin Salazar on Twitter @salazar_elin. Follow us @Spacedotcom, Facebook and Google+. Original article on Space.com .